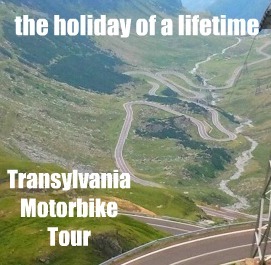 Local Knowledge: The idea of exploring Transylvania alone sounds tempting. It’s a great place to visit and stay for a number of months, if you have the time. But you are time poor. You don’t know the language the quirkiness of the local culture and what happens if you have a breakdown? The cultural differences can be significant, but that should not deter you from seeking new experiences. Relax, you can go out in the dark…yes, really! All you really want to do is step out of your everyday life for a quick couple of weeks, get your riding fix, to cover some of the best motorcycling roads on the planet and get back to reality. This is where I can help you. You cannot beat local knowledge. Have a look at the pictures taken on previous rides. I will make sure you’ll cover those in a safe environment and, perhaps more importantly, what places to avoid. notification on where your luggage be at the end of the day and where we’ll stay the night. This way you can complete the ride at your pace, take as little or as much time as you like. You can be rest assured that your place for the night is booked, and your hard luggage will be waiting for you when you arrive. Naturally you are also welcome to ride with the group if you do not want to navigate, break away and rejoin at will. We’ll swap mobile numbers so we can be in contact at any time if necessary! Fixed price – know what to budget: Hidden costs are everywhere and we all hate them. You pay for something, just to find out that there is something else you need to cover that you were not told of before. Riding with me, this will not be an issue. I have detailed what is included in the cost and what is not. For things that are not included in the total price I have put a budgetary figure. I also hate worrying about what happens in case of a breakdown. Sure I have Ducati cover worldwide but I also want to get going before I get too old…Where will I stay tonight? Will my tyres last? These are all boring things that hold me back from pure motorcycling fun! I don’t want to think about these, but unless they are sorted it can really mess up my ride. If this is also your concern, you need not. I organised a vehicle with driver who will carry our hard luggage, spares, tools etc. So all you have to think about is the road ahead and that your camera is fully charged each morning! Even in the event of a breakdown, if we cannot get the bike going, there will be a spare bike available. This is also the case if you ride your own bike.